More than just a magazine, National Geographic offer three different types of research grant: Early Career, Exploration and Requests for Proposals. They’re seeking proposals that are bold, innovative and potentially transformative with a primary focus in conservation, education, research, storytelling or technology. If you’re interested in applying to the National Geographic but not sure what type of grant to go for they have a quick quiz that can point you in the right direction – available here. These grants offer between $5,000 – $10,000 USD and aim to give less experiences individuals a chance to manage and lead a project. Applicants should have less than 5 years professional experience within their field. Available to those experienced in leading a project in conservation, education, research, storytelling or technology. This grant is typically between $10,000 – $30,000 USD. Request for Proposal grants are typically funded at $50,000 USD although funding up to $100,000 USD can be requested. All schemes above can be applied for at any time as National Geographic accept applications on a continuous basis. If you’d like to apply for any of these schemes then please contact your Research Development Team. Categories: Funding Opportunities | Tags: conservation, Ecosystem, Environment, Environmental Science, exploration, national geographic, Technology | Permalink. The Engineering and Physical Sciences Research Council (EPSRC), the Science and Technology Facilities Council (STFC) and the Natural Environment Research Council (NERC) will be announcing their priorities for the next five years in spring – so definitely worth keeping an eye on their websites! Materials scientist Alison Davenport will report to the STFC this year on a review of the council’s consolidated grants, which account for £100m that the council awards annually in research grants each year. Aerospace companies competing for a £92 million government contract to carry out a feasibility study on home-grown replacements for the EU’s Galileo Satellite Navigation System will find out if they are successful early this year. The UK is set to stop using Galileo for defense and critical national infrastructure after Brexit. The NERC’s polar research ship (The RRS Sir David Attenborough) will be undergoing a year of sea trials before before it’s polar expeditions begin in 2020. In the first few months of 2019 the government will review the implementation of the sector deals on automotive, artificial intelligence, aerospace and nuclear industries. The year will close with a crucial meeting for UK space with the science minister and representatives from the UK Space Agengy attending the council meeting of the European Space Agency in November – the members will be tasked with setting funding levels. Categories: News | Tags: Engineering, Environment, Environmental Science, EPSRC, NERC, Research, Science, STFC | Permalink. H2020 – Work programme 2018-20 is here! Slightly later than originally anticipated, the work programme for the final phase of Horizon 2020 has now been published and the first calls launched. As well as the areas that will be familiar to those with an interest in Horizon 2020, we also see the launch of the European Innovation Council (EIC), which brings together a number of support measures to foster ‘breakthrough, market-creating innovation’. The table below provides links to selected annexes of the work programme which set out topics for each of the key areas and associated deadlines. 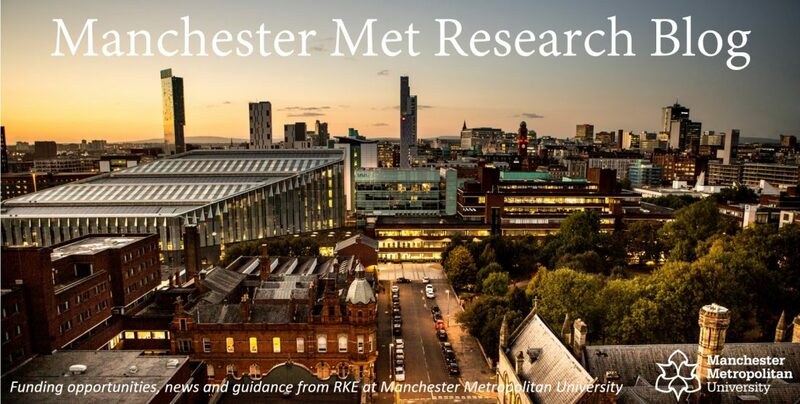 As ever, if you’re considering a proposal, please do get in touch (euro_res@mmu.ac.uk). You can also take advantage of our visit from Ian Devine of UKRO next week (31 October 2017) to find out more about the work programme and some of the thinking behind priorities. To book your place, please visit the registration page here. If you can’t make the 31 October 2017, Ian will also be speaking at the Universities of Salford and Manchester (1 and 2 November 2017). Please contact us for more details of how to register (euro_res@mmu.ac.uk). Horizon 2020 – Priorities and deadlines (details relating to the European Research Council can be found here). Categories: Funding Opportunities, Horizon 2020 | Tags: Advanced Manufacturing and Processing, Advanced Materials, Agriculture, Bioeconomy, Climate Action, Energy, Environment, ERC, Europe, Europe in a Changing World, European Innvation Council, FET, Food security, Forestry, Health, Horizon 2020, ICT, Individual Fellowships, Innovative Training Networks, Marie Skłodowska-Curie, Marine, Maritime, Nanotechnology, Research, Research Infrastructures, RISE, Science with and for Society, Security, Space, Spreading Excellence, transport, Widening Participation | Permalink. A new funding opportunity is being launched as part of a decade-long partnership between the UK’s Economic and Social Research Council (ESRC) and the Department for International Development (DFID) which aims to place innovation and appetite for risk at the centre of world-class research. Sitting within the ESRC-DFID Joint Fund for Poverty Alleviation Research, the Development Frontiers Research Fund aims to fund innovative, strategic and catalytic research with the potential to radically impact on sustainable development concepts or practices, or lead to new thinking and action on poverty reduction. Proposals are invited for projects with a full economic cost (fEC) value between£200,000 and £300,000. Projects can be between 12 and 18 months long, but must finish no later than 31 March 2019. They expect to fund around 14-18 awards, depending on the quality of the proposals received. NOTE: Eligible research organisations from the UK and other developed countries can lead on a maximum of up to two proposals to this call so, if you are interested, please get in touch with your Research Development Manager a.s.a.p. Categories: Funding Opportunities | Tags: conflict, DFID, Environment, ESRC, international, Social Science | Permalink. •environmental impacts of a 1.5°C temperature rise compared with 2°C. This call will support seven projects worth up to £100,000 each. The deadline for proposals is 18 Aug 16. For more information, please visit NERC. For support with your application, please contact Research Development. Categories: Funding Opportunities, Researchers | Tags: Climate Change, Energy, Environment, NERC | Permalink. The Natural Environment Research Council invite proposals for their call on improving health with environmental data. This supports projects that aim to identify and fill knowledge gaps about the potential use of environmental data in support of improved health outcomes in the UK, focusing specifically on air pollution and environmental hazards alongside health and biomedical data. Applicants must attend the brokerage event to be held on the 10th May in Edinburgh in order to be eligible to submit proposals. Categories: Funding Opportunities, Researchers | Tags: Data, Environment, Health, NERC | Permalink. The programme aims to better understand and represent the complexities of the natural environment in valuation analyses and to consider the wider societal and cultural value of ecosystems services by extending the concept of value beyond perceived market value. It is delivering this through a mix of research, network and cross‐discipline and impact activities. For more information, visit NERC. For support during your application, please contact Research Development. Categories: Funding Opportunities, Researchers | Tags: Environment, Impact, Interdisciplinary, NERC, Networking, Research | Permalink.